Wishing all my readers and friends a Very Happy New Year. I pray the God almighty to help all fulfil their dreams and wishes. I also hope and pray that the year brings in more peace and harmony through out the world. I’ve just returned back after visiting my parents and the temperature and weather change is trying to show it’s effect on my body and I’m trying hard to push it. I know I’ve not been able to acknowledge a few entries sent for ‘Only’ Cakes and Cookies, have patience, I’ll make it to your blogs in a day or two. I could not do it as my dad’s computer was not functioning properly. I am overwhelmed by the response my first cookbook review received. Do understand the word ‘response’ should not be identified with the number of comments, in those terms my blog is amongst the back benchers, LOL, … ‘response’ clearly means the page views the post received and the many mails I received congratulating me on my effort. I’m motivated to make more attempts in this field. I also want to thank all my blogger friends and others who stopped by to leave a note for me for the review post, I’m touched and your encouragement means a lot to me. This is my first post of the year and I wanted to start on a healthy note and at the same time I also want to tell myself that over hoarding food items and cooking excess food has to be avoided this year. It so happened that I was left with couscous salad made for the book review and some soaked couscous too. I was unable to bring myself to innovate something that could help me bring them to good use. To increase my despair, the milk I had got curdled while boiling and I had fresh cottage cheese too, to be consumed. I decided to combine the two products and add a few more ingredients to it to make it more tasty and then make some rolls, which I could use for snack and lunch box. Instead of frying the rolls I preferred to bake them to keep them low calorie. To my delight the rolls turned out crispy and crunchy and the kid loved his snack box. It was appreciated by his class mates in the school. As for me, I was surely happy as all the leftover was consumed in a healthy and tasty way and the kid ate nutritious food too, surely a blessing in disguise. Mix all ingredients and shape them into rolls. Roll the couscous roll in corn starch and then dip them in water lightly. Roll the couscous roll in breadcrumbs and keep aside. Repeat the procedure with the remaining rolls. Preheat the oven at 190C. Grease a baking tray and align 7-8 rolls and bake them for 12-13mins. In between turn them once. Bake till golden brown in colour, do not over bake. Serve hot with some salad and tomato sauce. If you find mixture wet, mix a potato else refrigerate for an hour and then make rolls. I’ve baked the rolls but these can be shallow/deep fried too. I’ve kept the flavours very subtle, one is free to make it more flavourful and spicy. 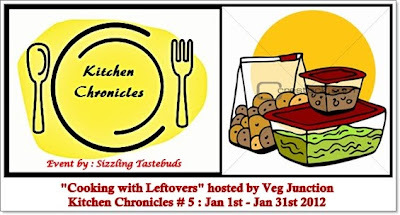 Kalyani’s Kitchen Chronicles, guest hosted by Veena Krishnakumar. what a great combination! Looks super delicious! Hi Pari,the click is fabulous!! Wishing you and your family a very Happy New Year..
Wow.. Very delicious and healthy snack.. looks absolutely inviting.. lovely shots too !! Rolls look simply delicious. Awesome preparation. Happy new year wishes to u and ur family..Rolls looks super delicious and definitely guilt free..
Looks delicious. Happy new year! looks so crispy would be as great starter!! Thats a wonderful and delicious Snack! Congratulations!! Good Going! Love those rolls. Inviting and healthy rolls. Thx for linking to the event.